August 3rd 2016 marks the 250th anniversary of the birth of the architect Sir Jeffry Wyatville. 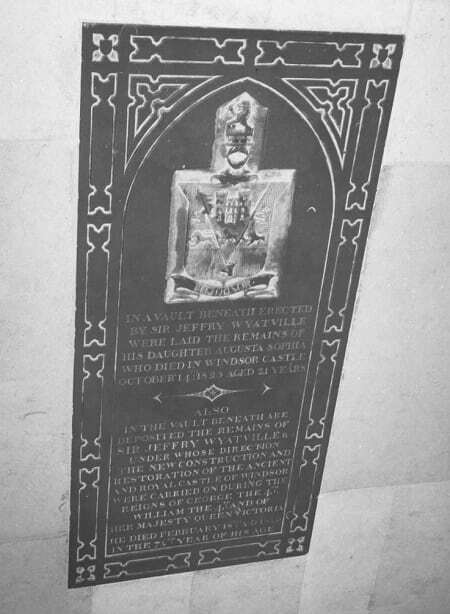 As the pictured ledger stone indicates, Wyatville was buried in St George’s Chapel on February 25th 1840; a fitting resting place for one who contributed greatly to Windsor’s iconic skyline. Much of the current aspect and arrangement of Windsor Castle is the result of a large restoration and remodelling project directed by Wyatville during the reign of George IV. Wyatville was born Jeffry Wyatt on August 3rd 1766, in Burton-on-Trent, Staffordshire, to Joseph and Myrtilla Wyatt. The family could boast a number of distinguished architects, designers and sculptors, including Jeffry’s uncles, James and Samuel Wyatt, and cousin Matthew Coates Wyatt. Jeffry was apprenticed first to his uncle, Samuel, and then to his uncle, James, who was appointed Surveyor General and Comptroller of the Works in 1796. In the early 1800s Jeffry began to build a successful career, and was elected a Royal Academician (R.A.) in 1824. During the reign of George III James Wyatt had started to redevelop some of Windsor Castle’s buildings in an effort to transform it into a gothic palace. In 1824, Parliament voted in favour of a £300,000 grant for the remodelling of Windsor Castle. A competition was held to select an architect to oversee the project and Jeffry Wyatt was successful. He moved into Windsor Castle, taking up residence in Winchester Tower. In that same year, George IV granted him permission to change his surname to Wyatville. Wyatville’s transformation of Windsor Castle into a romantic, gothic palace focused on the Upper and Middle Wards. New apartments were created for the Royal Family on the east and south sides of the Upper Ward and the State Apartments on the north side gained a new entrance; new towers and battlements were built and modifications made to those already existing; a gallery, known as the Grand Corridor, was added to the Quadrangle of the Upper Ward. A new entrance was also added to the south side of the Upper Ward, the George IV Gateway, which opened onto the Long Walk. Wyatville adjusted and amended the interior of the Castle, developing new rooms and spaces such as the Waterloo Chamber, created to display the portraits commissioned by George IV to commemorate the Battle of Waterloo. He also remodelled St George’s Hall, incorporating the chapel that had previously been adjacent to it. In the Middle Ward, the most marked change was the refashioning of the Round Tower, which was increased in height by approximately 30ft, enhancing the Castle’s gothic appearance and creating a distinctive feature in the Windsor skyline. Wyatville’s comprehensive programme contributed only one feature to the Lower Ward and that is no longer extant. During the reign of George III, the Wolsey Chapel (now the Albert Memorial Chapel) was selected to serve as a Garter Chapter House, where the Garter Knights could assemble before processing into St George’s Chapel. Work on this Chapter House lapsed but was revived during the time of William IV. In about 1835, Wyatville created a new entrance into the Wolsey Chapel and gave it a large porch, projecting 23ft into the Lower Ward. The porch was never used for a Garter ceremony and it was demolished in 1862 as part of the preparation for the new Albert Memorial Chapel. Wyatville enjoyed a long and distinguished career, designing and remodelling numerous prestigious buildings, including Chatsworth House, Longleat and Wollaton Hall, and received a knighthood from George IV in 1828. However, the modification of Windsor Castle remained his best-known work and when he died in London on February 15th 1840, he was returned to Windsor, to be interred with his daughter, Augusta Sophia, who had predeceased him in 1825 at the age of 21. The ledger stone that marks their burial place includes an image of the George IV gateway, an apt reminder to all who pass by of Wyatville’s enduring contribution to Windsor Castle.